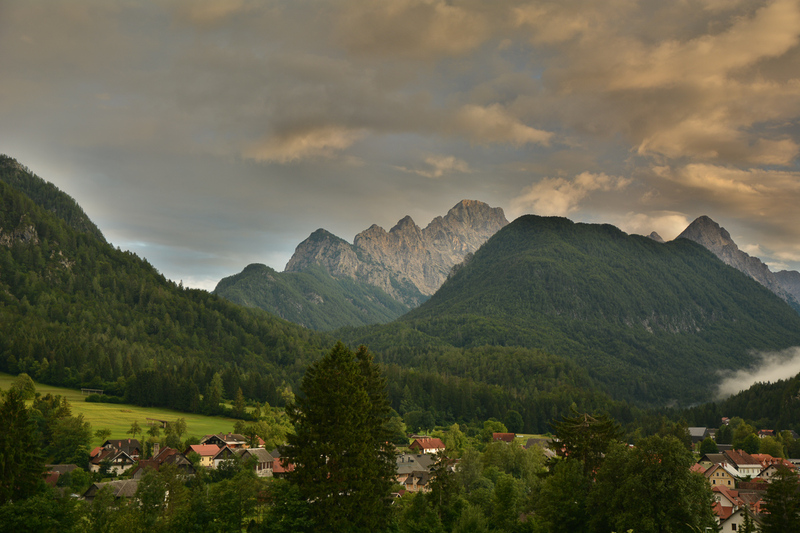 Slovenia is located between the Alps and the Balkans. 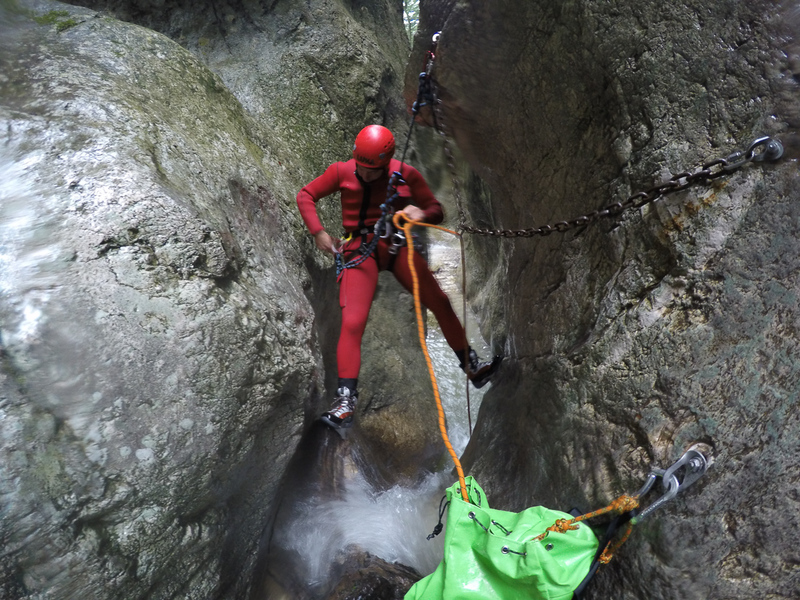 The visitors can enjoy rock climbing, bungee jumping, rafting, canyoning, ice cold rivers, green forest, mountain scenery and plenty of space. It is more than that. I call it the paradise for activity enthusiasts and the hidden pearl that should be permanently placed on European adventure routes. 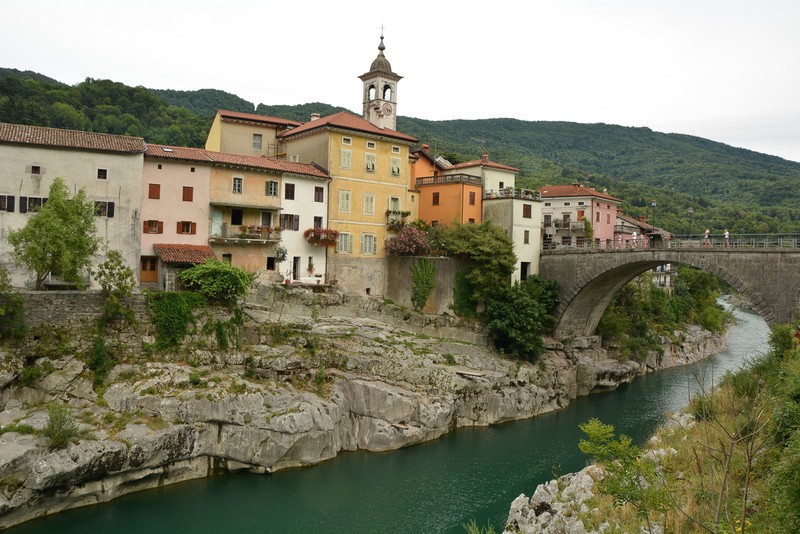 We enter Slovenia from the Italian side. We are nearby the town of Nova Gorica in the western part of the country. This is not just a random location. 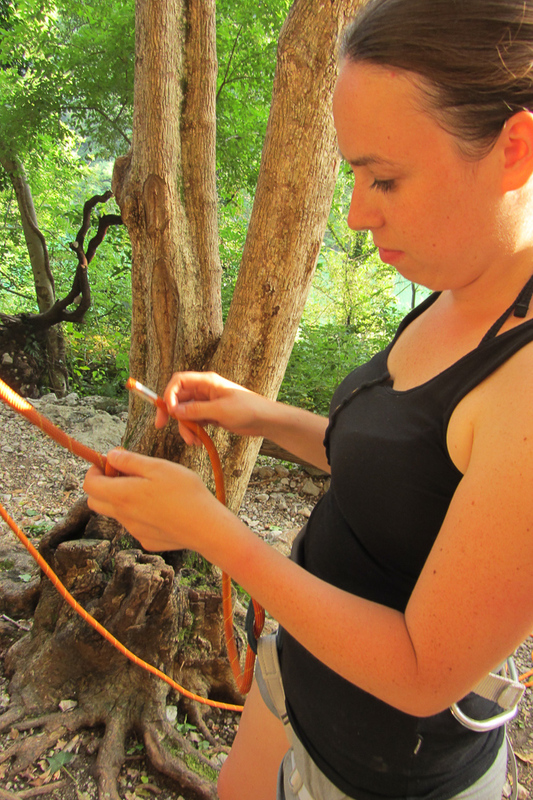 We are looking for a climbing spot called Dolga Njiva, which should be located some kilometres further north. After all, I know that finding that spot won’t be easy. We only have written directions in Italian. However, in Italy we could not find anyone who could translate it into English. Here comes the first cultural shock of Slovenia. We get help from a young guy selling peaches next to the road. He fluently speaks Italian, English and Slovenian. He is a very friendly guy too, so as we chat he treats us with his peaches and tell about the country. That’s just the beginning. A waitress in a restaurant, a cyclist that we accidentally met and everyone else – they all speak English. 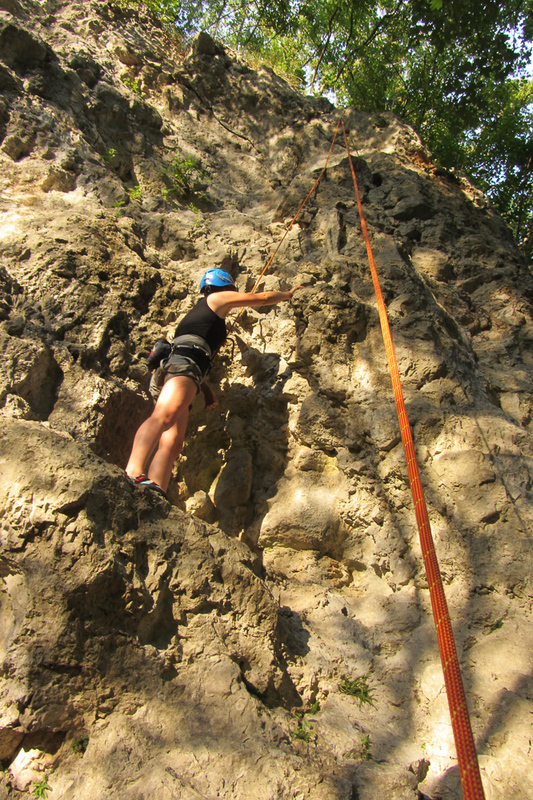 We easily with the climbing spot and generally speaking, everything seems to be easy now. 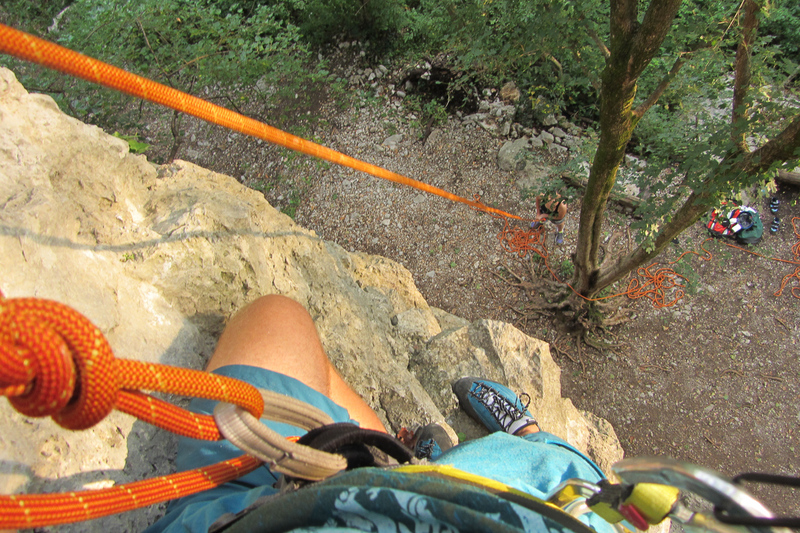 It takes some efforts, but eventually we climb some routes with funny sounding names: Ajajaj, Ejejej and Neč do Neča. The easier ones are in the range of 4a-5a, but seasoned climbers will also find much more difficult ones. The spot is shaded and has little traffic. Within a few sessions we meet just two Italians and a bunch of Slovenians. If you are looking for this spot just park the car in a third parking place accessible by driving 2-3 kilometers north of the restaurant Dolga Njiva. By the way, this restaurant is also worth recommending. They serve excellent ćevapčići skewers with grilled vegetables and other sensational dishes from traditional charcoal grill. Here you can also easily camp for the night and be just in time for the next day’s climbing. It is a rainy Saturday morning. At some point the rain turns into storm. 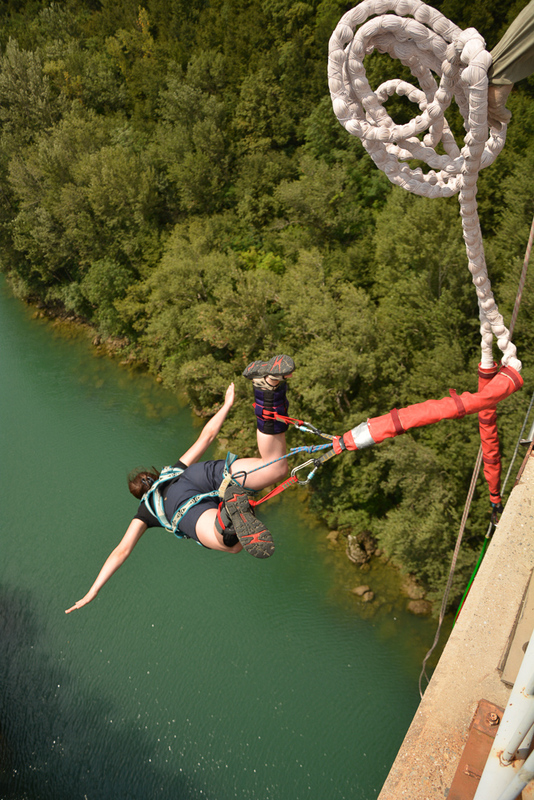 Probably today’s bungee will be cancelled. That’s life. 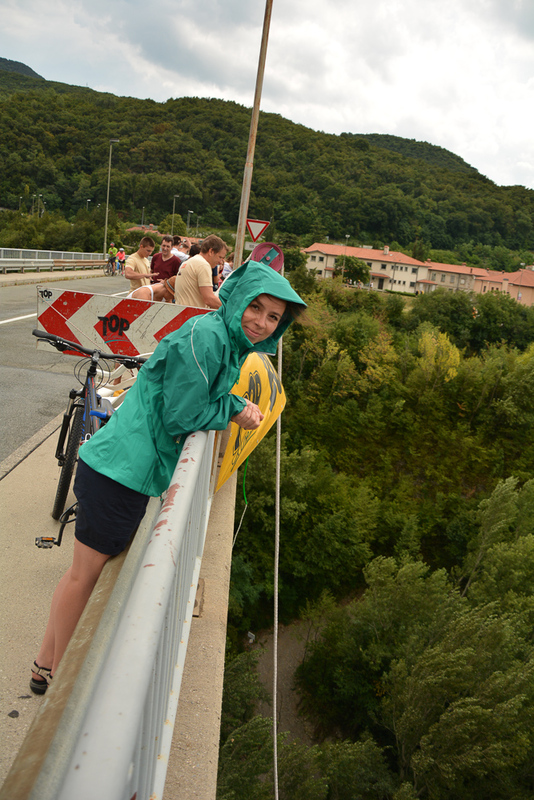 It turns out that in Slovenia it’s no problem even when it’s raining heavily. I explain to myself that they just use different type of lines than those used in the more touristy places. In any case, a temporary jumping post that is screwed to the bridge and the whole team gain my trust. Especially after seeing a few bungee survivors. 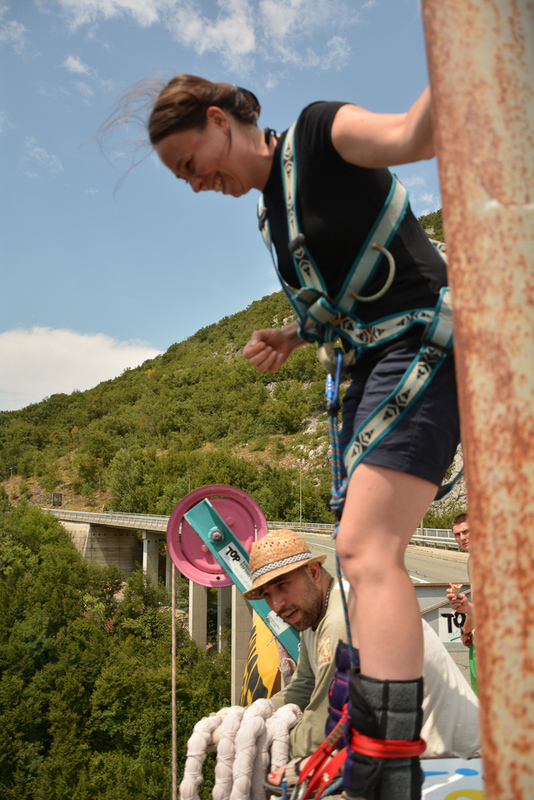 We are about to experience 55 meter flight from Solkan bridge built over the Soca river. The price is a little bit of stress plus 50 euros. In return you receive a few seconds of great excitement, which costs less than 1 euro per meter of flight that is quite good value ratio. Ela jumps first and she does that with an extraordinary grace and full control. Flying like a pro in a perfect downward vertical body position. Is she really doing it for the first time? Despite internal doubt, now I know it is too late to turn back. It’s much better to be already done with it. 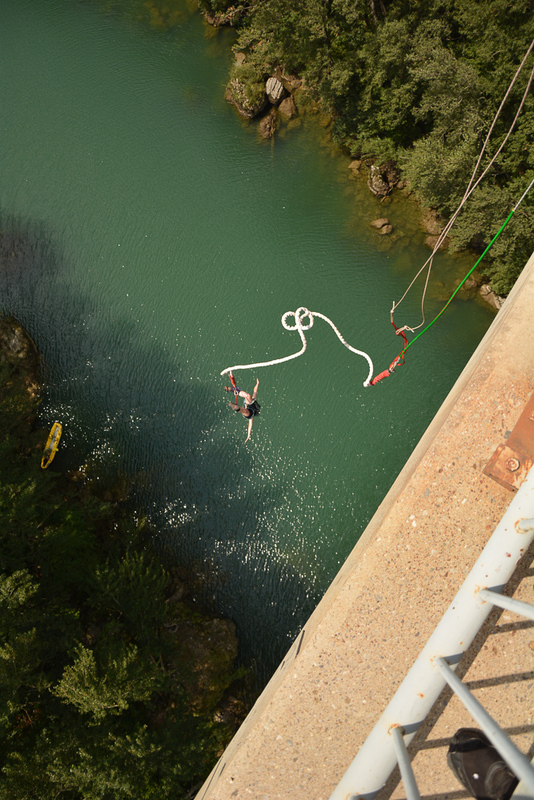 3 … 2 … 1 … bungee! Here comes a bummer! For the fear of underrotating the jump, I exaggerated a bit while bouncing off the post and I rotated more than 270 degrees to be heading downwards straight on my back. Did it hurt? I have no idea. In those few seconds the perceivable emotions each another level. The fear becomes your ally, the pain turns into adrenaline and shouting is only the expression of joy and satisfaction! 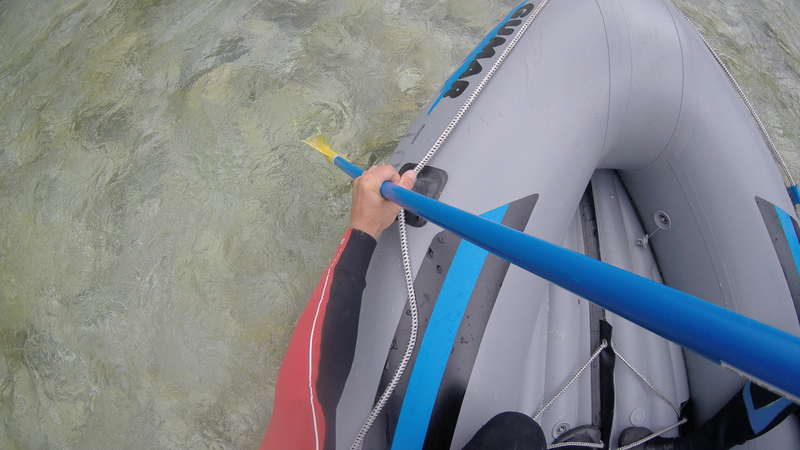 There is a pneumatic kayak waiting for us at the bottom. I can see it perfectly well hanging upside down several meters above. 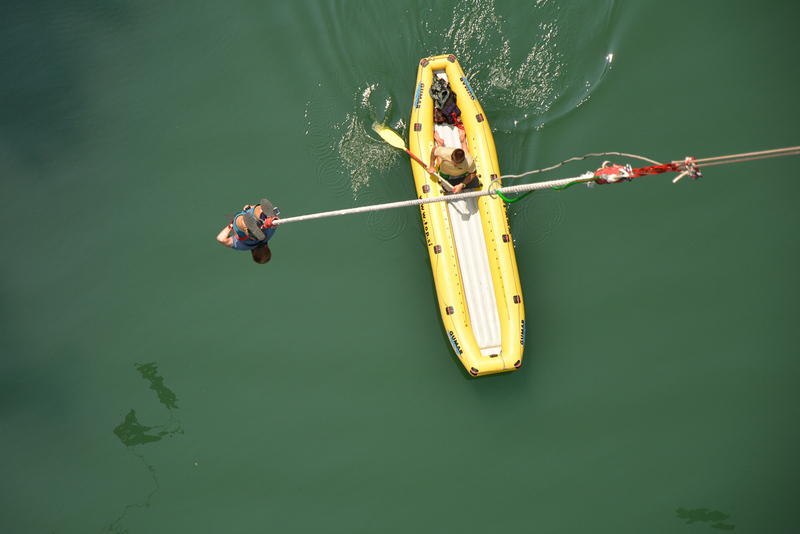 A guy in the kayak helps to get off the harness and carries each person over to the riverbank. The actual emotions arrive once you stand on a solid ground. Shortly after recovering from the adrenaline, when the heart comes to its normal rhythm, we conclude that this is something to be repeated someday! For those interested, I recommend: Top Extreme (www.TOP.si) or +38641620636. In the afternoon, we’re going back to our climbing spot and finish off the day with a massive dinner at Dolga Njiva restaurant. 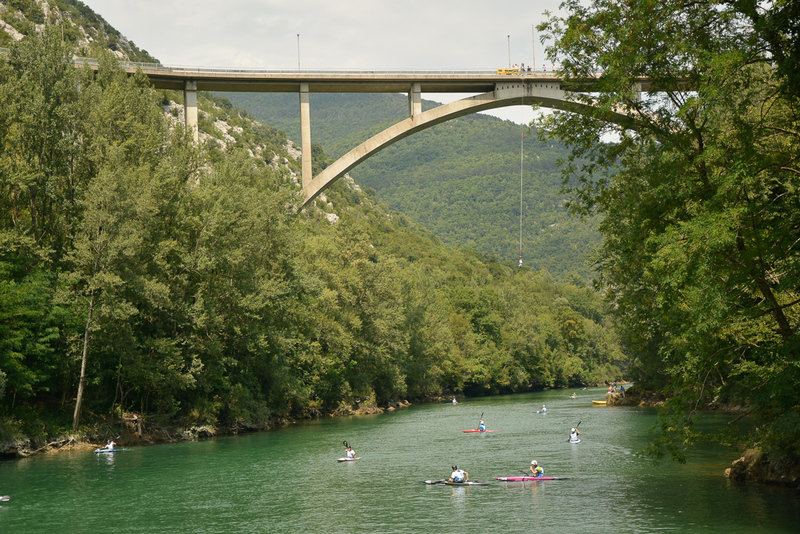 Over the next days we will slowly move north following “The Emerald Trail of Soča River.” This is probably the most interesting part of Slovenia. It is literally filled with walking trails, viewpoints, activities and historic towns that hide a lot of secrets. 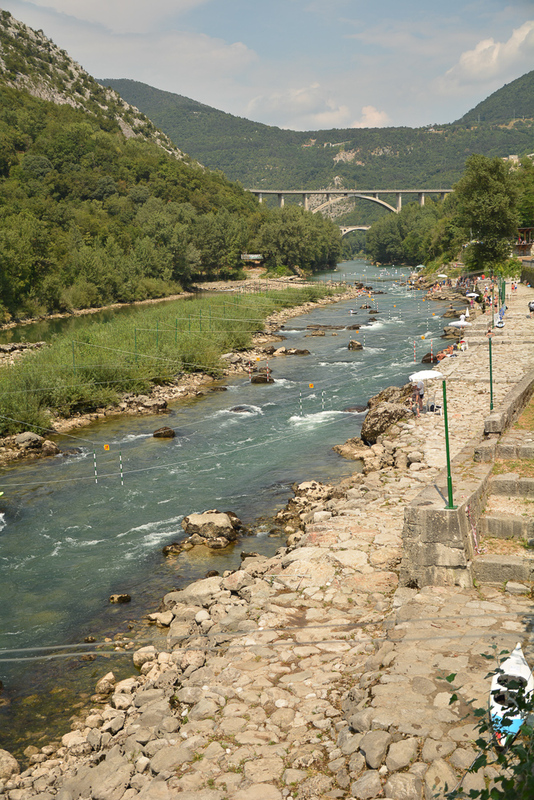 Krčnik is natural rock bridge carved by stream of water. In Kožbana we go to Trcinka, one of the “Cherry Blossom Trails”. The loop takes through small villages, across plantations of grapes (where I got stung be a wasp), forests and rocky paths. The trail is well marked, so it is rather difficult to get lost, yet it is still possible. All the villages have this special quiet and timeless atmosphere. We’re going in the direction of Kanal, the historic town dominated by stone architecture. 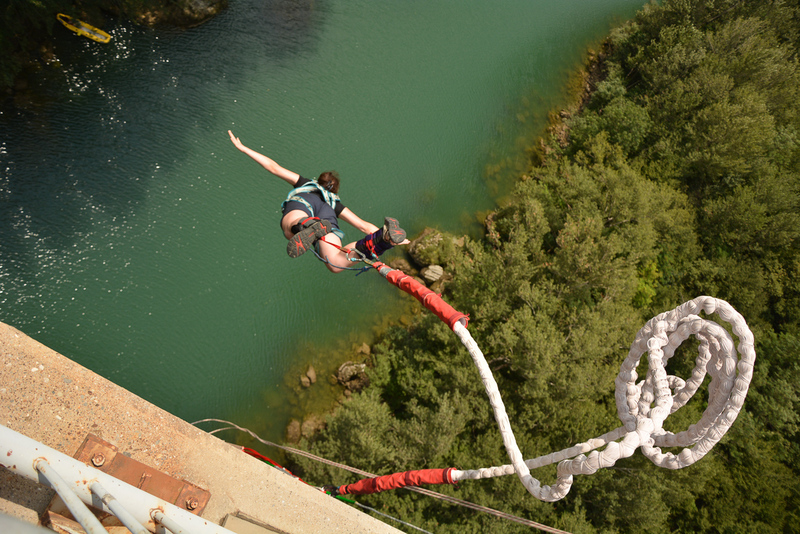 Kanal is famous for its annual competition of high diving into the water from an 18-meter-high bridge platform. That just one more reason to visit this town in August. We stop for the night in Tolmin. 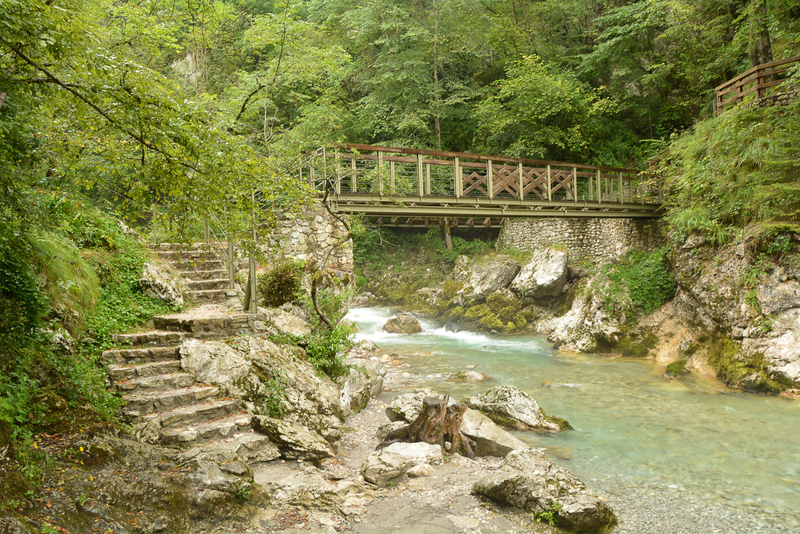 This is a place where tributary Tolminka joins Soca river’s. 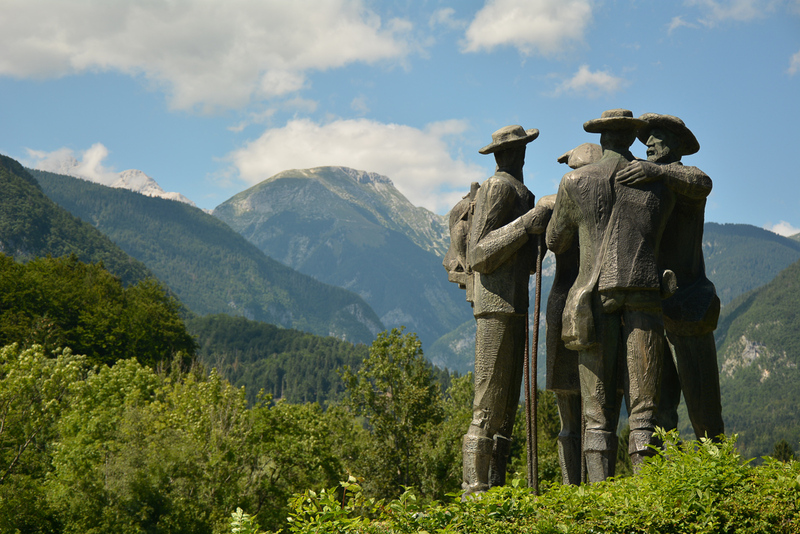 That is also a gateway to Triglav National Park. 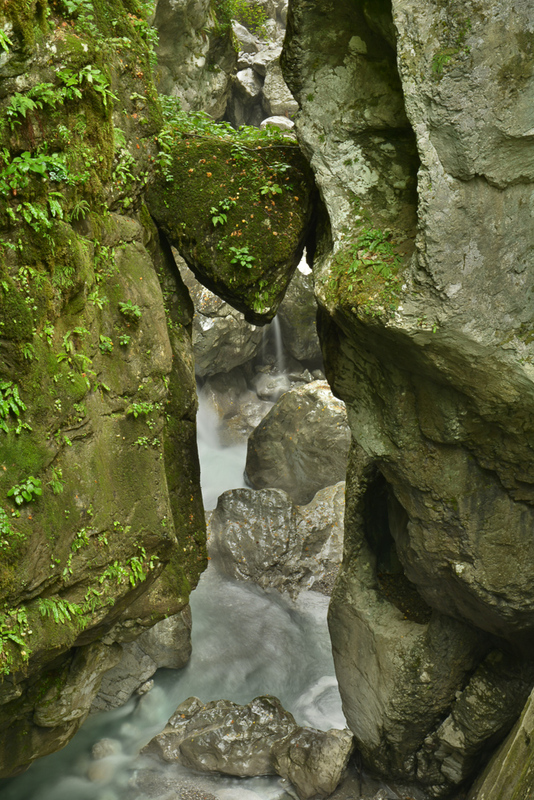 Located here Tolmin Gorges are interesting rock formations, which lived to see the special names such Bear’s Head or Dante’s Cave. There is also Devil’s Bridge, one among several other bridges that make exploring the canyon easier. 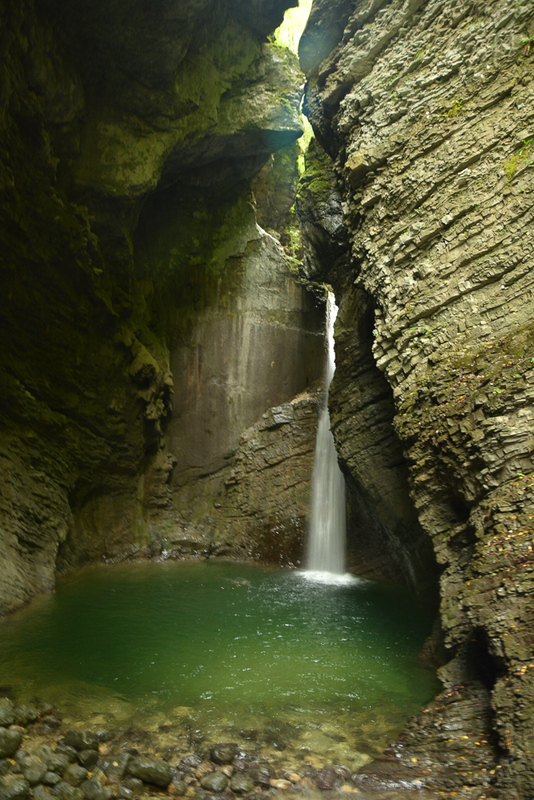 One of the most spectacular waterfalls on our route is Kozjak near Kobarid. Sometimes on the road you have to do laundry and just get organized a bit. After a few weeks the time to take care of that has inevitably came. 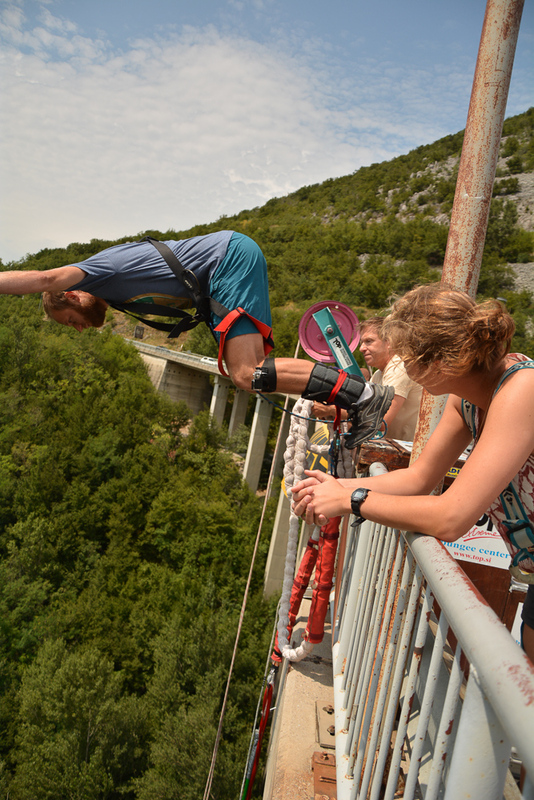 We arrive to Bovec, supposedly the local capital of extreme sports. We park at the campsite Polovnik and at this point it starts to rain. Clothes need exactly three days to dry, so we are looking for ways to entertain ourselves during the waiting time. We start with rafting. Apparently, the river’s section around Zaga village has difficulty class I-III. 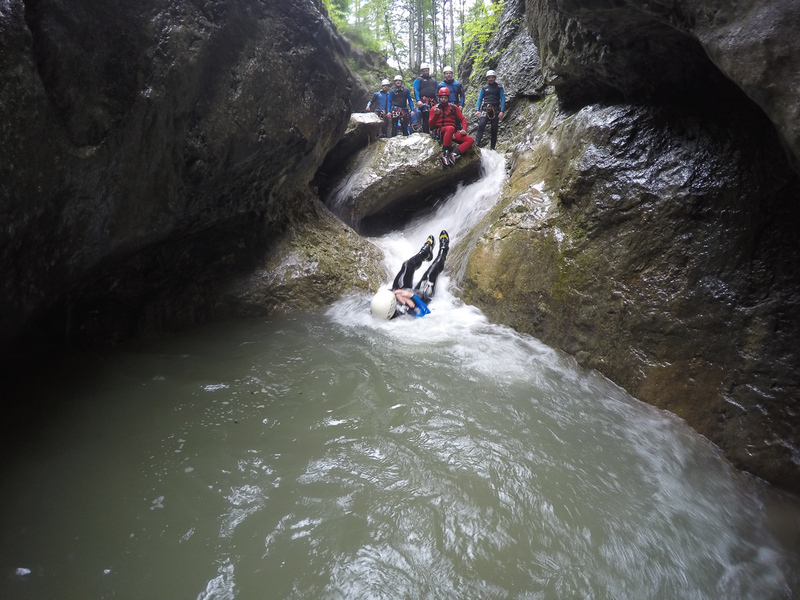 After a day’s rafting, we conclude that we should have chosen a bit more challenging section. I think it is a matter of replacing some parts of class I and II with class III. I reckon the optimal difficulty for beginners is rapids grade III+. It is worth to remember for the future as there are sections of any difficulty in the area. We also try to include a bit of trail running each day. With the surrounding peaks it is easy to achieve. I definitely recommend Svinjak. The trail is interesting and varied, mostly through the forest, but in the end there are rocks and some technical difficulties. I liked it so I’ve been there twice. It stopped to rain, our clothes are dry and we are ready to head east. 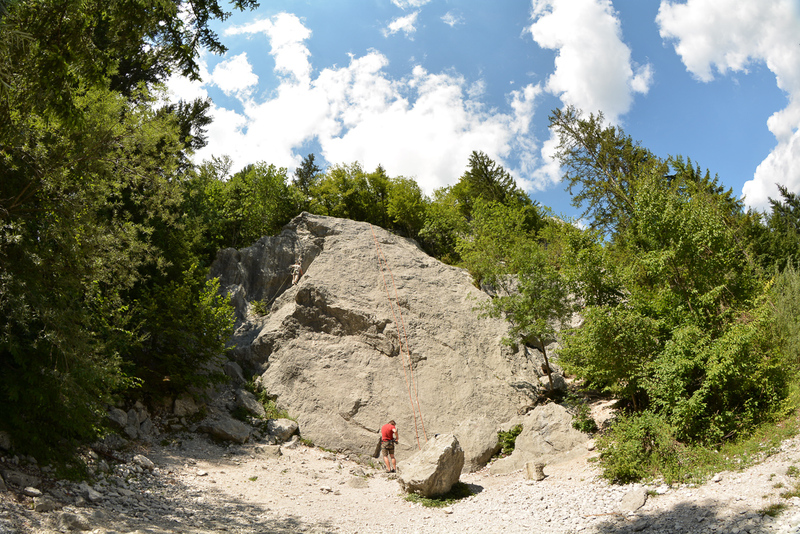 We spend the night next to Bellevue climbing spot near the village of Ribcev Laz on Lake Bohinj. In the morning there is a surprise. We are woken up by park ranger at 6:58am. He wants to give us a ticket for sleeping in the Triglav National Park. The park is “open indeed but only from 7 am”. After small negotiations we manage to relate the offense to another section (unauthorized parking) so from initial fine of €100 per person we get a ‘special price’ of €50 for both of us. Since we got up, let’s make most of this day. Bellevue climbing spot offers plenty routes to choose from that are split in several independent zones. It is suitable for every skill level and usually doesn’t get not crowded. We also spend some time exploring the surroundings of the lake. There are dense forests around and numerous mountain to climb and reach different viewpoints. There is even a trail from Ribcev Laz to Rjava Skala that takes you to a ski resort. Looking at these four gentlemen feels like joining them to climb Triglav, Slovenia’s highest mountain at 2864m above the sea level. 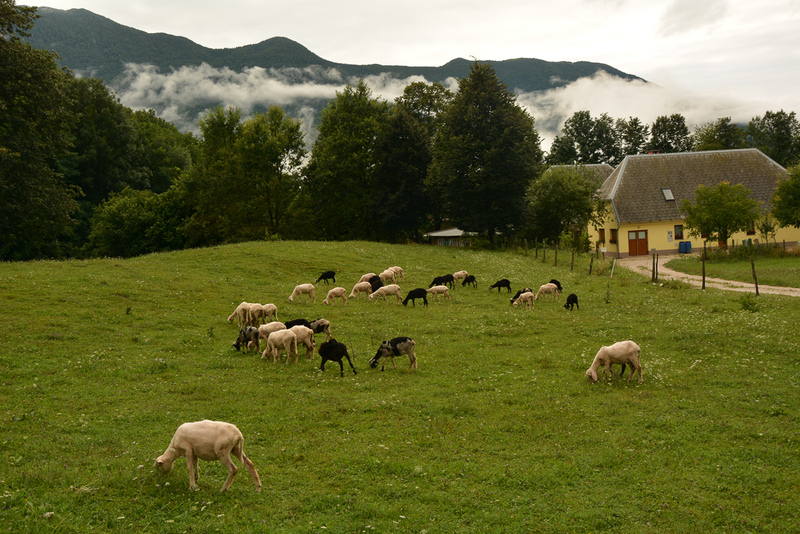 We stop in the village of Srednja Vas and walk up the trail towards Uskovnica. 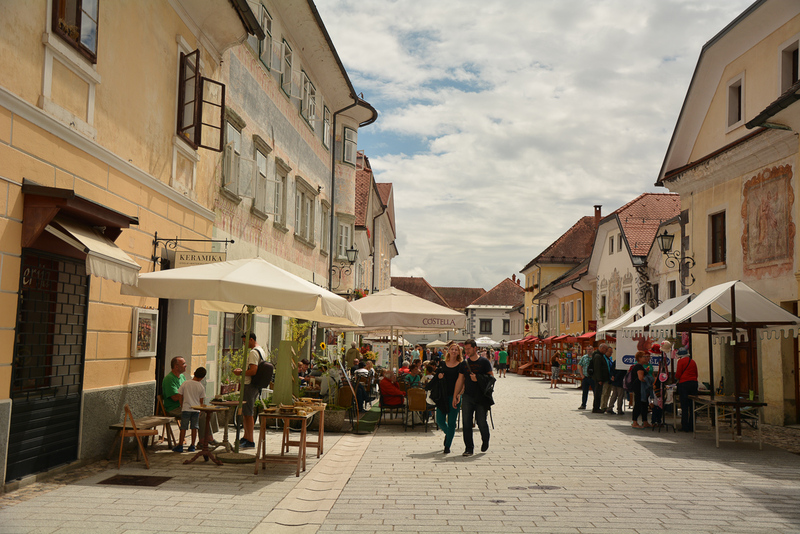 On the way we also stop at the town of Radovljica where there is some kind of a knight festival going on. 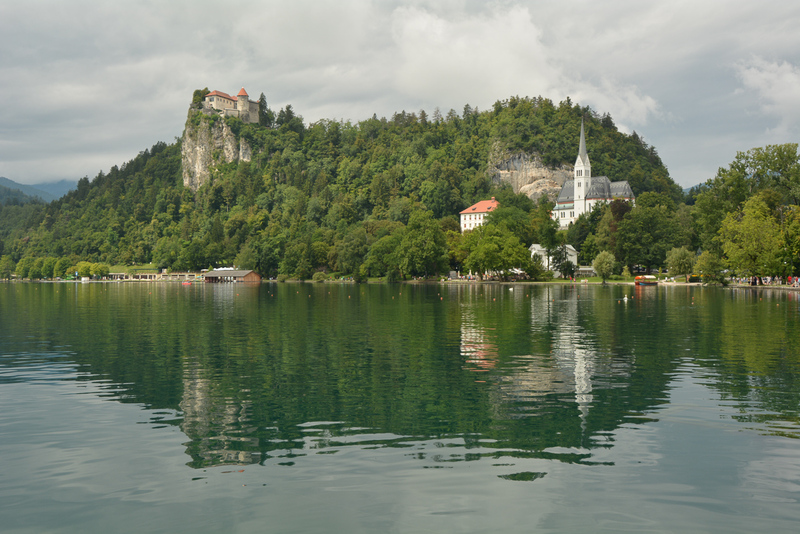 Lake Bled attracts visitors with beautiful location. 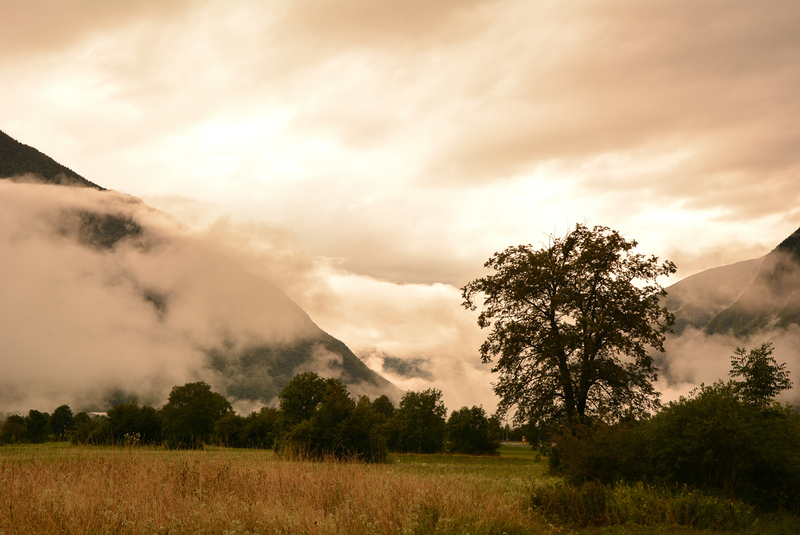 This place is surrounded by mountain peaks and green forests. In the middle of the lake there is a small island with medieval castle. Our entertainment options are definitely not limited to walking around the town. 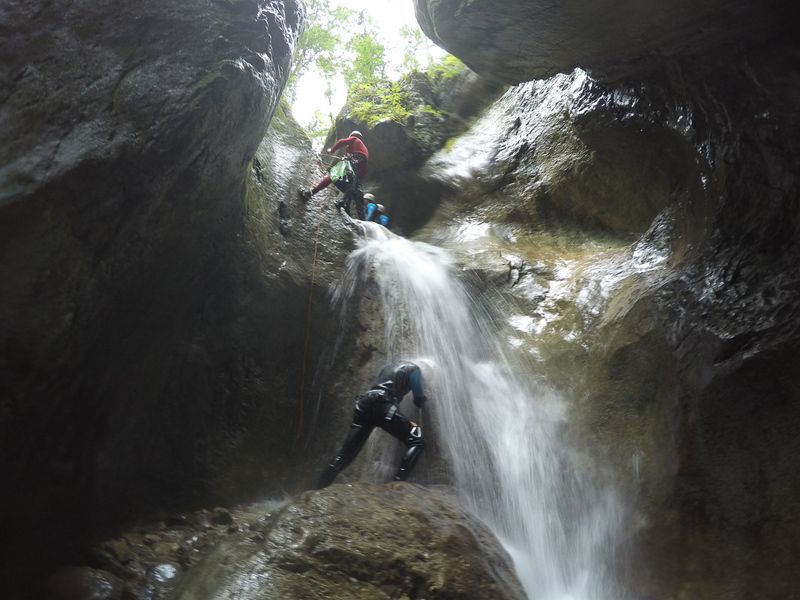 There is also a possibility to try canyoning. 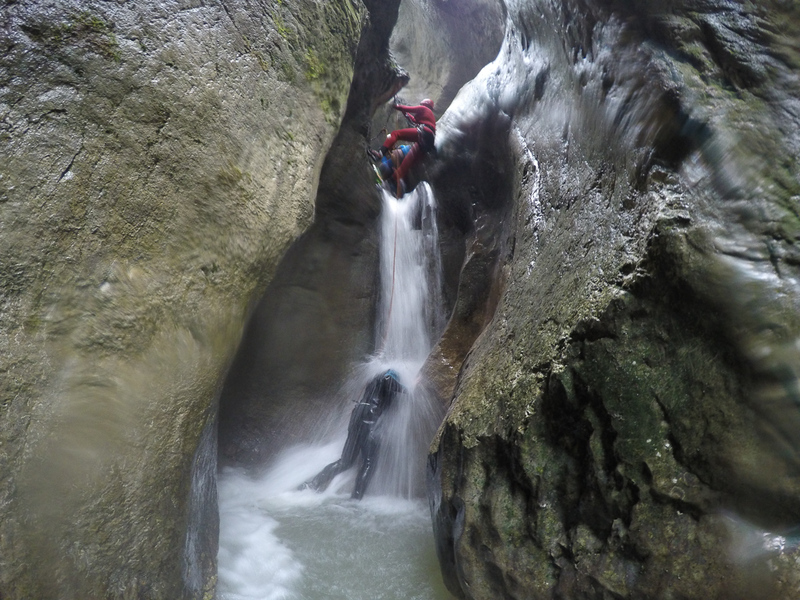 I am not sure whether Ela agreed to the idea just hoping that canyoning will be cancelled due to the rain. It won’t be. 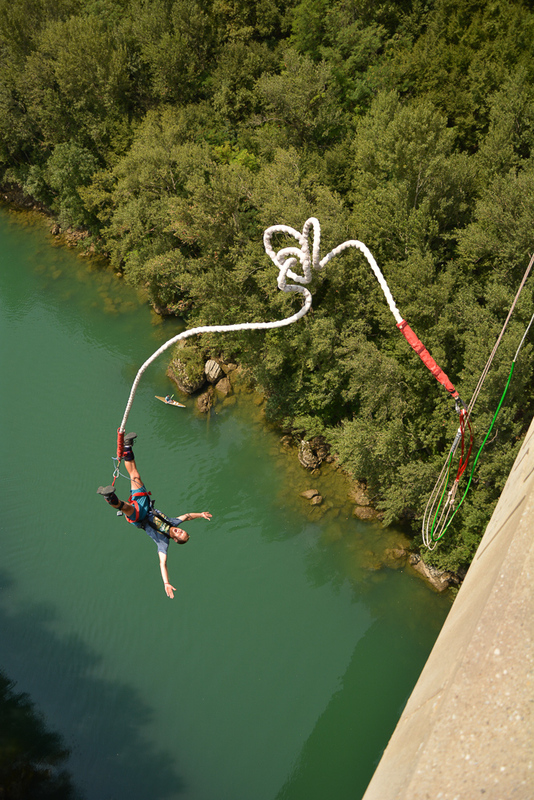 If bungee jumping in the rain is no problem at all, why would there be any problem to follow rocky riverbed and jumping off steep waterfalls? 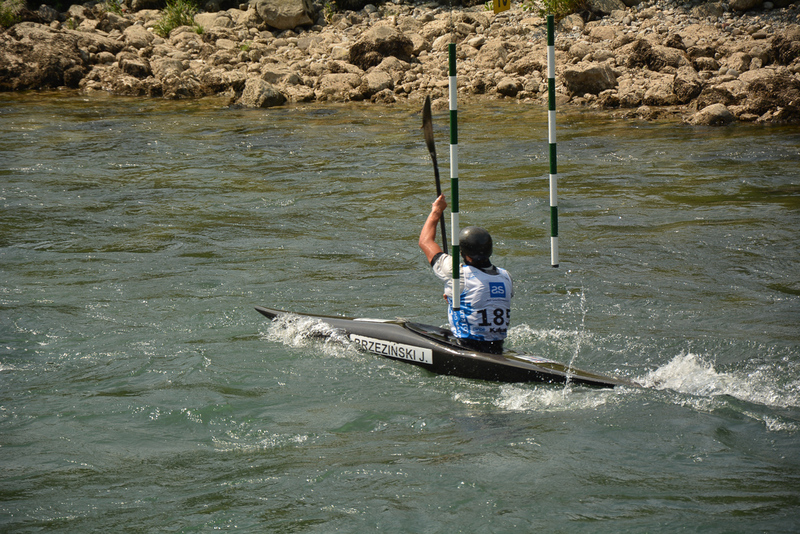 The river which we are about to traverse is located several kilometers west of Bled. We still have a little bit of time left for running in the mountains and enjoy the beauty of Triglav National Park. See you later Slovenia, we’ll definitely be back!